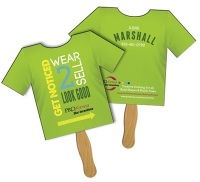 Custom Sandwich Hand Fans provide a more sturdy fan with more imprint area for your advertising message. Use Sandwich Hand Fans for a business card substitute that folks will keep and use. Sandwich fans can be screen-printed or digitally printed white card stock and have a wooden or plastic handle that is hidden or "sandwiched" between two full pieces of card stock. These are the most sturdy hand fans available also providing the most imprint area available. These promotional fans are made from heavy, high-quality material, better than many other materials used for hand fans. Wooden or plastic handles are glued in between two pieces of card stock. 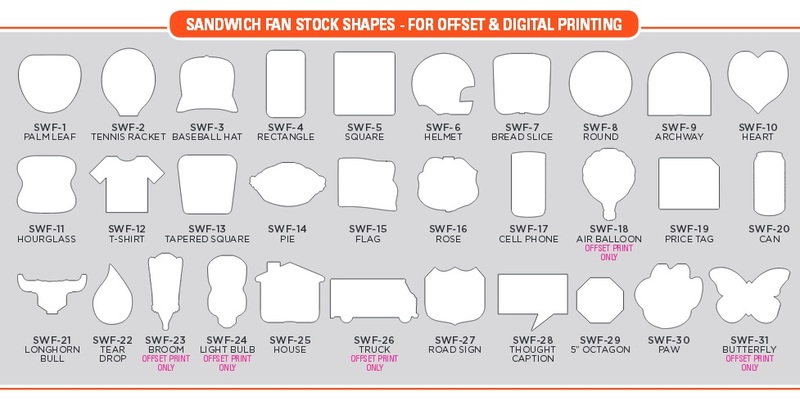 Our Sandwich Fans are available in many stock shapes displayed below. Contact us at 706-374-0710 for pricing on custom shapes. 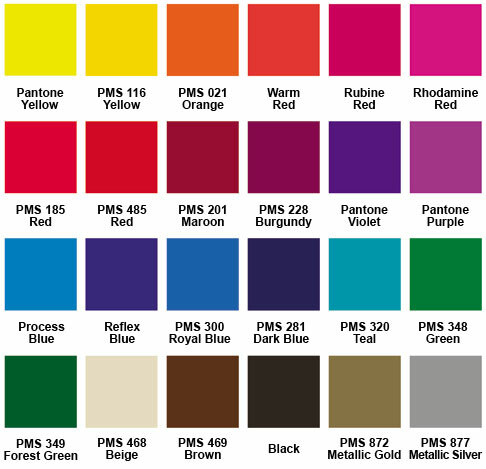 Choose any of our standard colors (see chart below). Each hand fan is about 8" x 9", not counting the handle. Production time approx. 2 weeks. Two sided stock fan folded with stick sandwiched in between. Both sides are liquid laminated for high gloss finish. Sticks are glued (not stapled) for safety and appearance.Sandwich fans are high quality 22 point paper board, liquid laminated fans, with the wooden or plastic stick glued between the stock for a clear message on both sides. Full imprintable area on two sided fan, front & back. 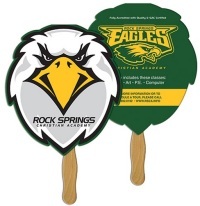 Fold over hand fans act as mini billboards & are perfect for getting your custom message noticed at sporting events, trade shows, fund raisers, churches, restaurants, business events, political events & more. Offset Sandwich Fans - liquid laminated on both sides. Printed on high density paper board 44 pt finished product with wooden or plastic stick handle. An additional $35 per color non-refundable artwork charge must be paid before work can begin. Add an additional $45 charge for logos and/or photos. If acceptable artwork cannot be provided, additional art charges will apply. No additional charge for standard colors shown below. We offer the following stock shapes for the same low price. All shapes shown below are available for offset printing. Two sided stock shaped fan folded with stick sandwiched in between. Wooden or plastic sticks are glued (not stapled) for safety and appearance. USA made sandwich fans are digitally printed in full color on high quality 12 point paperboard. Stick is glued between the stock for a clear message on both sides. Fold over fans act as billboards and the two sided fan doubles your advertising space to get you custom message noticed. Multi color imprintable. Get noticed at sporting events, trade shows, fund raisers and much more. Digital Sandwich Fans with full-color printing are liquid laminated on both sides. Printed on high density paper board 24 pt finished product with wooden or plastic stick handle. An additional $35 non-refundable artwork charge must be paid before work can begin. Add an additional $45 charge for logos and/or photos. If acceptable artwork cannot be provided, additional art charges will apply. All shapes shown above are available for digital printing except for air balloon, broom, light bulb, truck or butterfly.